Bill Scherr remembers a time when he and his brother Jim were not so diplomatic growing up in Eureka, S.D. That was then, this is now. The brothers who once used such sibling rivalry to make each other great on the wrestling mat, including at the Olympics, are working together through USA Wrestling to battle another foe: the choice by the executive board of the International Olympic Committee to remove wrestling from the Olympics’ official program after 2016. As opposed to the attitude you need to take on a wrestling mat, the former wrestlers turned businessmen knew there was a better way to deal with the threat to end Olympic wrestling. “From my position as CEO of the United States Olympic Committee and his position of sport for the Chicago Olympic bid, we’ve been able to build those relationships with IOC members over time,” said Jim, who remembers speaking to Bill within two minutes of hearing the IOC announcement on Feb. 12. “We both had an idea of the shortcomings of the leadership in wrestling and the mistakes they had made and understood the process of what the IOC had gone through. The Scherrs’ leadership has been critical the last few months. Jim was standing nearby as an associate to new FILA director Nenad Lalovic when the international wrestling association made its official bid to remain an Olympic sport in late May in Russia. Bill is galvanizing CPOW’s domestic agenda in the United States to ensure wrestling was picked as one of three finalists to be an Olympic sport in 2020 and 2024 in that May meeting. 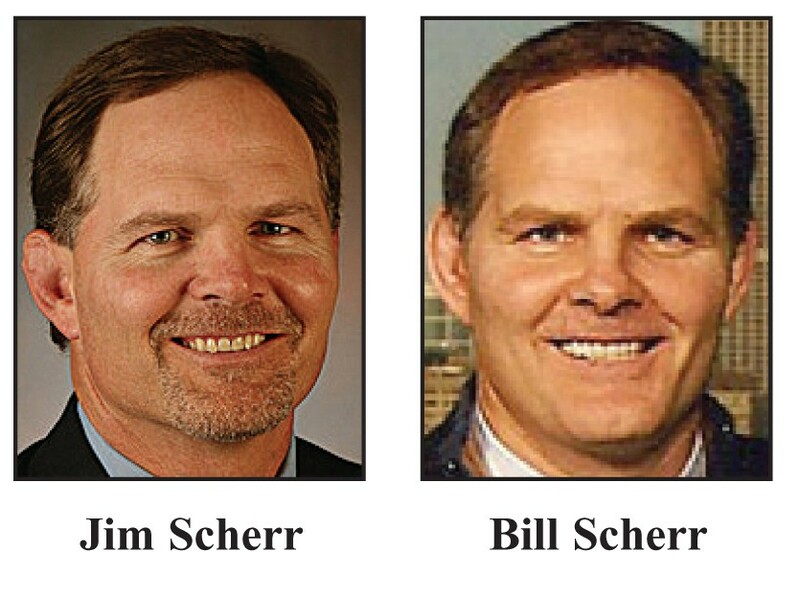 And for their efforts, the Scherr brothers have been selected the Mike Chapman Impact Award winners for 2012-2013, presented annually by Wrestling Insider Newsmagazine (WIN). “Jim and Bill Scherr have been an integral part of the amateur wrestling scene for over three decades,” said Chapman, the founder of WIN. “They excelled as elite competitors and as leaders and their expertise is needed now more than ever. But it’s the people skills that the twins have developed that led to several impressive positions in the business and sports world. Jim, the executive director of USA Wrestling from 1990-2000, became the first Olympian to serve as chief operating officer of the U.S. Olympic Committee (2005-09). He recently became the CEO of the inaugural European Games, which will be held in Baku, Azerbaijan, in 2015. Bill made his home in Chicago, where he served as vice president for Goldman Sachs and was heavily involved with Chicago’s effort to earn an Olympic bid. He also has stayed close to wrestling and served as a volunteer assistant coach at Northwestern under former coach Tim Cysewski. There is a good chance that both men could be in Buenos Aires, Argentina, in September when the IOC Congress meets to determine what sport — wrestling, baseball/softball or squash — will be selected to compete in the 2020 and 2024 Games. “I think we have gained some perspective on the methodology and environment of the international sports community,” said Bill. “It requires diplomacy. The IOC is a group that is well meaning and well-intentioned for sport. Instead of coming in and telling the (IOC) why we are entitled to a spot in the Olympics, both Jim and I believe we need to convince them why it is to their advantage to include wrestling. And while it seems like the “worst” of times in wrestling has brought out the best in the Scherrs, both believe it’s a team effort. “There are a lot of people involved but certainly Bill and I are uniquely positioned to make an impact,” admitted Jim.